Each volume of WRITERS OF TODAY is a dialogue between noted literary critic Walter Kerr and one of the best known writers of our time. 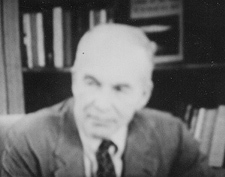 Produced in the 1950s, these programs provide rare profiles of these men as they discuss contemporary literature and society at the time of their own writing peaks. Auden bemoans the declining role of the poet in society. He decries the increasing mechanization of form and yet believes poetry is more personal than ever before. He explains that the problem lies in the grand scale of modern events. How, for instance, might a poem about World War II be written? In defining what makes a poet, Auden says "If one is stimulated by arbitrary restrictions, that person may be a poet." O'Connor defends the often maligned short story. He argues that a proper short story cannot "be developed" into a longer work because novels revolve around an individual's relationship to society, and how that individual integrates into it. A short story, to O'Connor, is about an individual's relationship to other individuals, or to himself. O'Connor also points out the different uses of time in the long and short forms, and goes on to defend greater objectivity in writing, speaking against the "mood" story, as he feels that mastery of the visible universe will ultimately result in its illumination. Miller expounds his views on the role of theater in society. He contends that the play is "the last way the human race has to face itself without any intervening machinery," that movies and television are "filtering out the intimacy of human contact." He envisions the playwright as an "ordinary citizen... who can organize things dramatically." His criticisms of theater? Prices are too high, the play has taken on the "aura of a special event," and audiences are drawn primarily to blockbusters. Librarian of Congress, FDR Cabinet Member, and Pulitzer Prize Winner, MacLeish shares his concerns about abstract poetry. "An abstraction remains an abstraction - you don't know anything but that formula." Of his drive to write poems, he states simply "Man I am, Poet must be." Robert Penn Warren focuses on the creative process of writing. He discusses with Kerr the search for Identity which is ubiquitous in his novels and poems as a metaphor for writing itself. The fundamentals of fiction - place, characters, story - are also discussed, but Warren insists that without an innate "germ," one cannot simply learn mechanics and become a writer. Asked about his students, Warren says it is too often true that "they want it quick and easy." An intimate and revealing look at Henry Miller, and his life and work through this program from the archives that originally aired on television in Quebec in 1969.